Soft and flavorful on the inside with a great crisp on the outside. Enjoy them with the honey-ricotta spread and a drizzle of honey for the perfect bite! Stir together all ingredients for the lemon-honey ricotta in a small bowl. Refrigerate until ready to use. Note: if your honey is hard or crystallized, heat it for about 8 to 10 second in the microwave, until liquid, then allow it to cool before adding it to the ricotta. In a large mixing bowl, combine the warm water and yeast. Stir together and allow mixture to sit 5 to 10 minutes. Add the buttermilk, melted butter, and maple syrup and stir to combine (wet mixture). In a separate bowl, combine the flour and sea salt. Pour the flour mixture into the bowl with the wet mixture and mix until all clumps are out. Cover bowl with plastic wrap and allow it to sit at room temperature for least 3 hours or overnight. Add the beaten eggs and baking soda to the waffle batter and mix until combined. Heat your waffle iron and spray with cooking oil. Measure out about ½ cup of batter and pour onto the hot waffle iron. Replace the lid and allow waffle to cook until golden brown, about 1 to 2 minutes. Repeat for remaining batter. 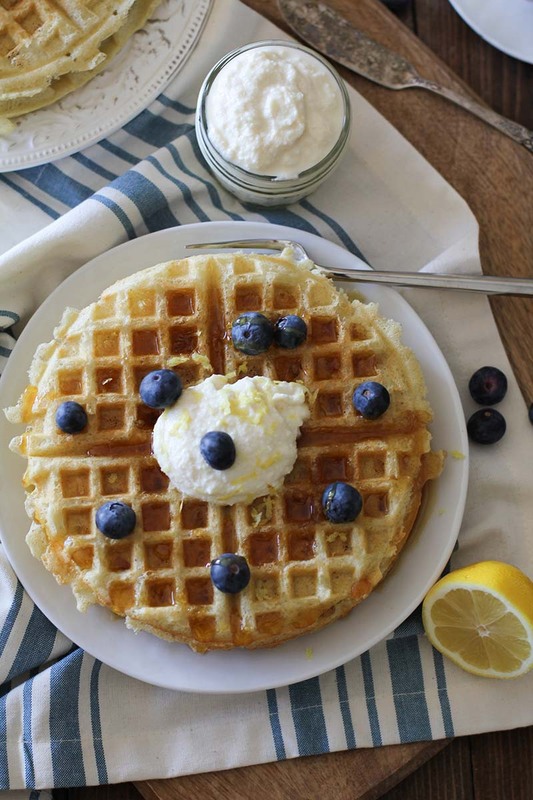 (6) Serve waffles with honey-lemon ricotta spread, a drizzle of honey, and fresh blueberries. These look awesome! can’t wait to make this.